There are many gadgets in the market which sync your smartphone with your watch or wristband. The only problem is, it is bulky and might not be as stylish as you hope it would be. Finally, a solution. 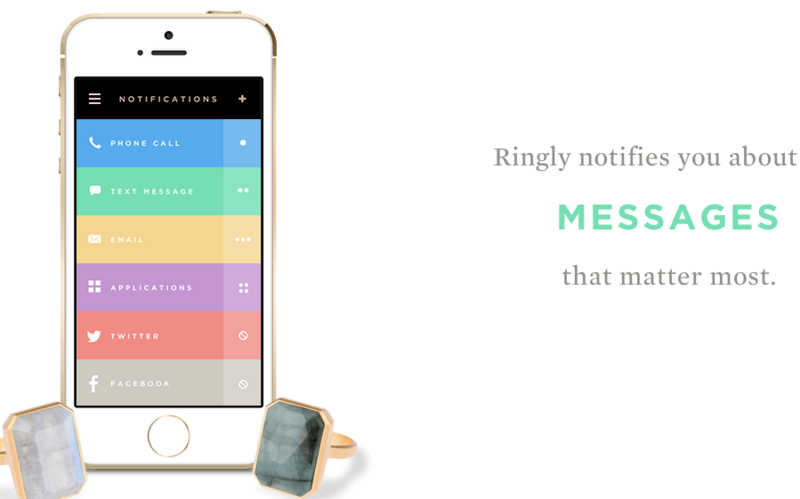 Ringly is not just wearable tech, it’s fashionable tech. The 18k-gold plated ring comes in 4 different stones, which vibrate and blink when an important text or call has arrived. Subtlety is key. There is also a filter within the Ringly application, so one can choose which application(s) to receive notifications from. The user will also be able to customize the vibrations and notifications. Charging the ring is simple. All you need to do is drop it back into the box it comes in – hassle-free. Perfect for the modern woman on the move. Editor’s note: We love the idea so much that we had to buy one for keeps. Turns out the first 1000 customers who make a purchase will get a Ringly featuring a genuine diamond. They didn’t say how many carats, but a diamond is a diamond, right? For a limited time only, each Ringly costs US$145/US$180, normal pricing will resume from Fall 2014. Pre-order here, for 25% off.